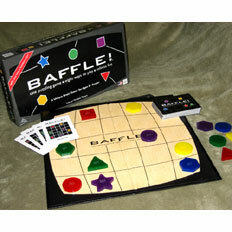 TDmonthly® - New Toys and Games: Baffle! from FLYING RABBIT ENTERPRISES INC.
From: FLYING RABBIT ENTERPRISES INC.
Other products from FLYING RABBIT ENTERPRISES INC.
Baffle! consists of a 5 x 5 grid of 25 squares on the game board, plus 25 game pieces in five shapes and colors. 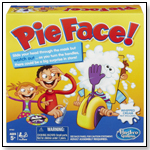 The player strategically places and removes pieces to accomplish the goal of each particular game. In Baffle! Classic, he must end up with a configuration in which each row, column and diagonal has a piece of each shape and a piece of each color. 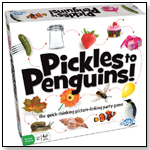 — At the Play House Toy Store in Durham, N.C., this game is a best seller, Owner Donna Frederick told TDmonthly in late November 2009.